I wanted to press that reset button again, so I committed to a 5-day fast. At the end, I made it a 6.5-day fast. This is my personal experience report, nothing more and nothing less. I am not a doctor and this is not medical advice! Before you decide to engage in fasting or any other profound dietary change, consult your doctor. Your condition and reaction to fasting may be very different from mine! Fasting and certain diets might not be suitable for you at all. Don’t stop your medication! Talk to your doctor. Why did I start with fasting? People fast for mental performance, spiritual/religious reasons, detoxification, weight loss, and a variety of other reasons. I fast for metabolic health, mental performance, weight loss, and happiness, and I fast reluctantly. About seven years ago, I became aware of research by Prof. Roy Taylor of Newcastle University, UK on metabolic health. Using an 8-week very-low calorie diet (600 kcal per day), he was able to reverse type-2 diabetes in the majority of the subjects who took part in his experiments. First, the liver accumulates fat due to long-term excessive calorie intake. As a consequence, it becomes increasingly insulin resistant and less able to regulate blood sugar. On top of that, it releases some of this fat into the bloodstream. As a knock-on effect, fat is taken up by the pancreas which now also becomes fatty. Because of the liver’s insulin resistance and slowly rising blood sugar levels, the pancreas needs to pump out more and more insulin, yet due to fat piling up in itself as well, its insulin response deteriorates. This process goes on in two phases: During the first phase glucose levels rise slowly over a period of years. 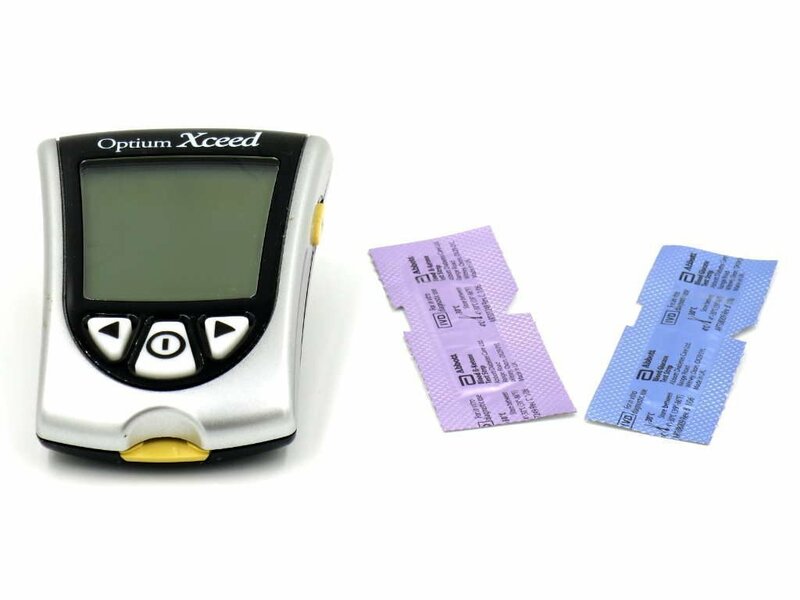 At some point the system can’t cope anymore; in this second phase, the body loses control over blood sugar levels and they rise fairly quickly over a period of about 18 months. Note: Prof. Taylor doesn’t talk about excessive fat intake, but excessive calorie intake. The liver converts excessive carbohydrates into fat! He speculated that by getting rid of the fat in both the liver and the pancreas he might be able to reverse the diabetes in his patients. To test this hypothesis, Prof. Taylor and his team put people who had been diagnosed with type-2 diabetes for up to 4 years on an 8-week 600-kcal diet. They tracked blood glucose, insulin response, and, using a special MRI technique, fat in the liver and the pancreas. The result: After one week on the 600-kcal diet, in most subjects fasting blood sugar levels had returned to normal, and after 8 weeks the pancreas insulin response had gotten back to normal as well. MRI showed a corresponding loss of fat in these two organs. Taylor concluded that their very-low-calorie diet was effective in removing the fat from the liver and the pancreas and normalizing liver and pancreas function as well. His explanation for this association is that the fat in these organs caused insulin resistance and later onset of type-2 diabetes. In their experiments, they used a diet consisting of three meal-replacement shakes and a plate of non-starchy vegetables per day. However, Prof. Taylor clearly states that you don’t need to use his specific diet. Most diets that help you to lose comparable amounts of body fat should do. His subjects weighed 103.7 kg on average and lost 15.3 kg or about 15 % of their weight during the 8-week diet. He also emphasizes that the amount of fat a person can tolerate in the liver and pancreas is highly individual! Some seemingly slim people might already have too much fat in these organs, while some clearly obese people can tolerate much higher levels. Note: In the following I am going to use the terms blood sugar and blood glucose interchangeably. Back to my specific case:. At 100 kg (now 95 kg), I am overweight; it just doesn’t show all that much because I am 1.9 m tall. Instead of following a very-low-calorie diet, I decided to do 5-day fasts to prevent disease and become as insulin sensitive as I can. At a later stage, I might try a completely different approach! What I like a lot about Prof. Taylor’s lectures is that he is completely undogmatic about what kind of diet a person wants to use. He doesn’t mention fasting at all; I wanted to experience fasting! This has been my third fast. Last year, I did a 3-day and a 5-day fast. At the beginning of last year, during an extended stay in Taiwan, I was getting more and more carbohydrate-intolerant. I would eat rice or potatoes, or even only an apple, and half an hour later I felt unwell, even slightly depressed. It was all controllable, but unpleasant nevertheless. I felt best before eating! In case you are wondering: I tested my glucose in 30-minute intervals after eating for the next couple of hours. My blood glucose was in the normal range. In the course of this research, I came across the book on fasting and blog by Dr. Jason Fung. Dr. Fung is a Canadian kidney specialist who uses fasting protocols with obese and diabetic people. He has to deal with a rather serious side-effect of uncontrolled blood sugar: damaged kidneys. After failing to make people adhere to his prescribed diets, he decided to put them on fasts instead. In addition to Dr. Fung’s info, the podcast by Damien Blenkinsopp who reports extensively on his fasting, the fasting protocol of Tim Ferriss (described in his book Tools of Titans), and a variety of other sources (see the notes section below) helped me to plan my first two fasts. The 3-day fast was to test the waters, and having made it through that one, I went for my first 5-day fast a few weeks later. After that fast, I no longer felt sick after eating carbs. Moreover, the energy dip I had experienced three hours after eating largely disappeared. I felt a lot more balanced during the day. 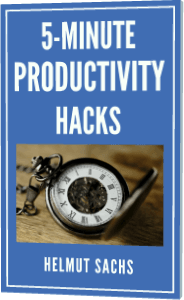 It was like day and night: I could work for hours on end and my mind was generally sharper. Additionally, the onset of hunger was much more gradual. I could just go on for another two hours if I wanted. I decided to make this one another 5-day fast. During my previous fast, it took me about three days to completely make the switch to a fasted state. I felt weakest on the second and especially the third day. The final two days, my energy returned and the fast was pleasant. So I definitely wanted to get to the enjoyable part again. What’s more, it takes a while for blood glucose and insulin levels to come down. Only in a low-insulin state can the body burn significant amounts of fat. I couldn’t measure insulin levels, but I did measure blood glucose and blood ketone levels (explanation below) during my previous fast. The longer you stay in a low-insulin state the more fat you lose. To me, five days is a good compromise. The fast can still be fit in a work week, yet is long enough to get glucose down and burn a good amount of body fat. I decided on the time period from Sunday night, March 4 to Saturday morning, March 10. That would have been a 5.5-day fast. I eventually extended by another day and broke the fast on Sunday, March 11. So in total, I fasted for 6.5 days. What did I eat and drink during my fast? Every day, I drank plenty of water, three cups of coffee, and carbonated water (club soda). I tend to have low blood pressure. Based on my experience with a 6-week ketogenic diet (a high-fat, moderate protein diet where carbs are only about 10% of calories) and my previous fasts, I decided to add salt to my water during the fast. As the body uses up most of its glycogen stores (chained glucose molecules) and insulin drops, the kidneys excrete water and sodium. With the sodium goes some potassium to balance electrolytes. If don’t eat enough salt, my blood pressure gets too low and I feel weak. Consequently, I ate about 6-7 grams of salt per day during the fast, about half of it natural sea salt, and half iodized table salt. I also added ¼ tsp (1.4 g) of lite salt (containing 290 mg sodium and 350mg potassium) to my water every other day. 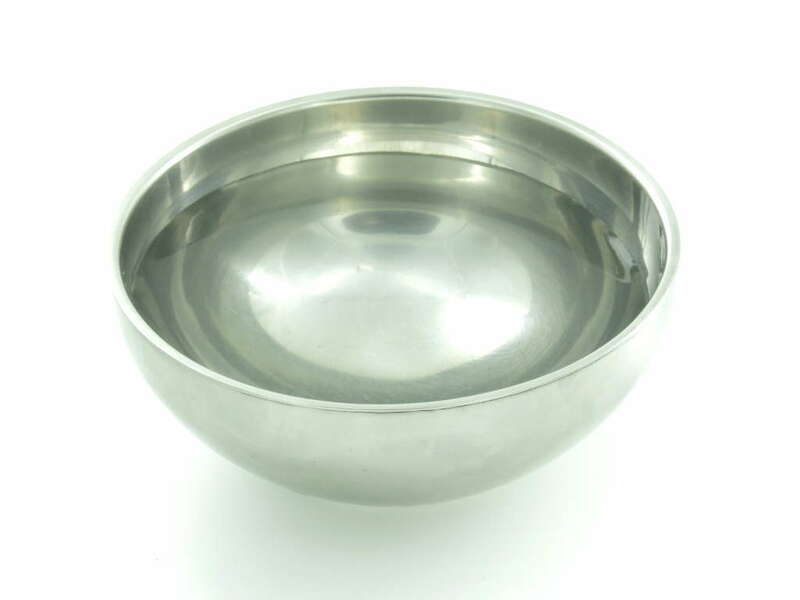 Some days, I just drank a glass of water with 2 g of salt in the morning and then periodically licked salt from a small bowl containing my daily ration. I didn’t finish my ration every day, but I could always see how far off I was. I also took two to three capsules of magnesium citrate (160 mg of magnesium per capsule) for a total of 320 to 480 mg daily. Initially, I had forgotten the magnesium, but cramps in my calves in the early mornings soon reminded me. Magnesium citrate can lead to loose stools, but I think the citrate formula might also help to reduce the risk of kidney stones. It may have been a coincidence: the lower back pain I experienced towards the end of the second day disappeared when I took two capsules of magnesium citrate. I stayed on it for the remainder of the fast and the lower back pain did not return. I allowed myself a little energy boost by adding 10 grams of fat, about half butter and half MCT oil to my coffee, three times a day. One gram of fat is roughly 9 kcal, so that amounts to 270 kcal per day. Unlike protein and carbohydrates, fat only minimally raises insulin. I got inspired to add MCT oil through Tim Ferriss’ fasting protocol, detailed in his book Tools of Titans. He also adds branched chain amino acids (BCAA), which I didn’t. I might look into that in the future. MCT oil gets directly shuttled to the liver, where it is preferably converted into ketones, an alternative fat-derived fuel source for the brain (and most other cells in our body). After about two to three days of fasting, the liver produces enough endogenous ketones (from body fat), but at least during the first two days, MCT oil and dietary fat in general might make the fast a bit easier. Alternatively, one could also use coconut oil or just butter. I made it half butter and half MCT oil. I also did some reading on the maximum sustainable fat burn rate per kilogram of body fat and day. In particular people with a low BMI and fasting newbies might not be able to maintain their metabolic rate when solely burning energy from fat stores. Twenty to thirty grams of added fat per day can make the fast sustainable. Dr. Fung, in his Complete Guide to Fasting (p. 254), also allows up to a table spoon of coconut oil, MCT oil, butter, or ghee per cup of coffee. But, in particular with MCT oil and coconut oil, you have to build up slowly. Some people get GI problems if they ingest too much pure fat. I tested this well before fasting by adding increasing amounts of MCT oil to coffee. If you haven’t been doing a ketogenic diet or fasting, you may not have heard of ketone bodies or ketones. On a standard diet with lots of carbs, the brain relies almost completely on glucose for its energy needs. And it needs a lot of energy – about 560 kcal per day, so that is about 140 g of glucose. During fasting, our stored glucose (in the form of glycogen) gets depleted. To compensate for any shortfall, the body increases glucose production (gluconeogenesis) from protein and fat. After about two days into the fast, the liver also starts making ketone bodies (ketones) from the released body fat and gradually reduces the amount of gluconeogenesis. Ketones serve as an alternative fuel source for the brain and most other tissues, thereby reducing the reliance on glucose. During prolonged fasting, 70% of the energy for the brain can come from ketones. Most people are familiar with a blood glucose meter, even if they haven’t used one. 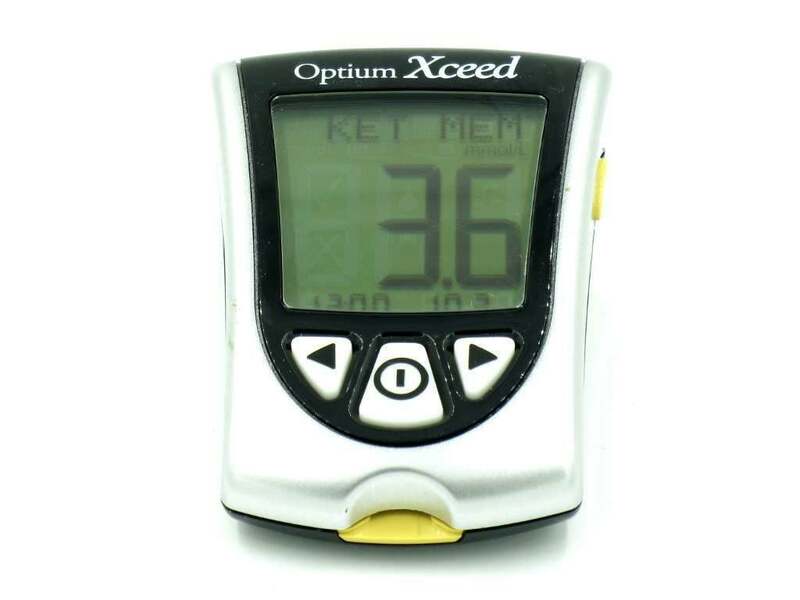 Some blood glucose meters can additionally also measure blood ketones. I have such a meter and use it to determine when my body starts producing ketones and recognize patterns between glucose and ketone levels, and my well being. 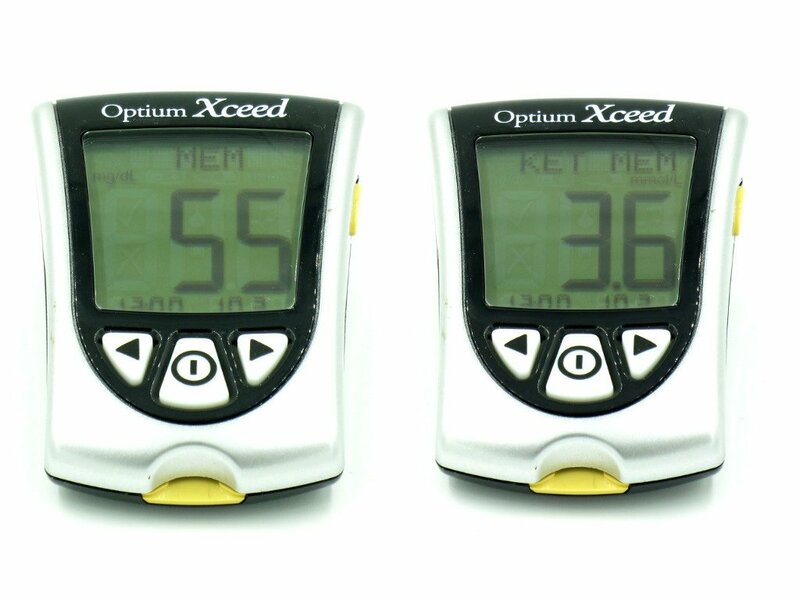 These meters measure blood ketones in mmol/l. Moderate ketosis starts at 0.5 mmol/l. During fasting or a ketogenic diet, ketones can go up to 5 or in some people even 7 mmol/l. I measured a maximum of 3.6 mmol/l during this fast, and I felt great at that time. I don’t think this is to be treated as a competition though. After all, this is fuel, and when properly adapted, the body should produce just enough. During this fast, it took about 36 hours for my liver to produce significant amounts of ketones. I will add a graph at the end of this post. You obviously don’t need a blood glucose or ketone meter to fast. But, these numbers have been of great help to me to better understand my metabolism, and they motivate me to stick with the fast. A glucose meter is also a great tool for checking the impact of meals and other diets on blood sugar. Quite a few athletes check these levels too. Initially, I didn’t really feel like pricking my finger, but, to my surprise, I have found it easy. I started my fast Sunday, March 4 late in the evening. Monday, the first full day of my fast was smooth sailing. I felt hungry at my usual eating times, but it was pretty easy not to eat. I just drank my coffee with some fat, water with added salt, and carbonated water (club soda). The afternoon I spent in my favorite coffee shop doing some work on the computer. I had plenty of energy throughout the whole day. My sleep during the first night felt fine, but checking my Fitbit dashboard in the morning, I noticed that I had only spent about 25 minutes in deep sleep, and I had had frequent longer awakenings during the night. On day two, I was getting noticeably hungrier, but still nothing out of the ordinary. On day two of my previous fast, I had felt quite weak, so this was a definite improvement. This time, either due eating more salt or getting used to it, I felt fine. I was getting some lower back pain later during the day and got a bit concerned about my kidneys. After two magnesium citrate capsules, the back pain vanished. Coincidence or not, I don’t know. My sleep was poor. I woke up quite frequently during the night, and overall, my sleep didn’t feel right. On day three, I felt considerably weaker. Hunger pranks were coming and going. I felt slightly hypoglycemic for parts of the day. I still walked to my coffee shop, but I just didn’t have a lot of energy. I suspect that by that time my glucose reserves had been mostly depleted, and my body hadn’t yet made the full transition to the fasted state, where it supplies enough ketones. To prop up my energy, I replaced half of the butter in the coffee with MCT oil, so I added five grams of butter and five grams of MCT oil three times a day to my coffee. Next time, I might add an additional 10 grams on day three and see whether I can improve my energy levels on that transition day. So this time it was clearly day three when I felt the hungriest and weakest. Overall though, it was all bearable. I missed eating a lot. Not a lot of fun, but I felt it was easier than during my previous fasts. I spent about 40 minutes in deep sleep (it varied from 25 min to 1 hour during the fast) and again had frequent awakenings. On day four, I felt a lot better. I felt almost no hunger and my energy was high throughout the day. It was easy to focus for long stretches of time. During most of day five, I felt fine. I experienced great mental clarity. In the evening though, my stomach started growling. I also had a bit of acid reflux. I had light diarrhea and was getting weak again. To overcome boredom, I had consumed at least three cans of club soda. I suspect that I had overdone the carbonated water and upset my stomach. I was also getting hiccups. Hunger wasn’t an issue, but my GI tract wasn’t happy. The constant growling really bothered me during sleep. Not very refreshing! On day six, the stomach growling and light diarrhea disappeared. I drank a glass of water with apple cider vinegar and also added lime juice to my water during the day. I think these two things might have fixed it. Also, I stopped drinking club soda. I had a lot of energy. This was the first night I slept well during the fast. Surprisingly, Fitbit noted that I had again had very little deep sleep. But the frequent awakenings were absent. On day seven, I felt really elated. I had already extended my fast by an extra day. I was now at 6.5 days. Originally planned were 5 days. I felt great and the growling had gone. I was considering extending by a second day, but I also wanted to enjoy my Sunday with food. 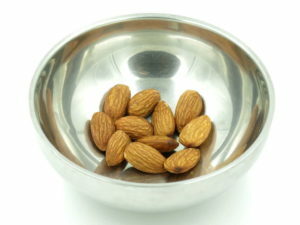 I broke the fast at around 11 am with a snack of 10 grams of roasted almonds. Dr. Fung suggests something light like a few nuts, so I just followed this. I read on a fellow faster’s blog that he had suffered some unpleasant GI issues by breaking the fast with a fatty bone broth. I also heard that eggs and dairy can be problematic. So I stayed away from that. For the remainder of my Sunday, I opted for two vegetable smoothies with some added protein in the form of ground-up pan-fried pork shoulder. Note that the watercress was actually morning glory (Chinese water spinach), but I couldn’t find that in the database. Also, I cooked the morning glory before blending it. Cooked or stir fried morning glory is a very nutritious vegetable, but raw morning glory is not safe for consumption! I would have used spinach, but my supermarket didn’t have any. I blanched the other vegetables for a few minutes to make them more easily digestible. All in all, I ate about 1000 kcal on that Sunday. I did not have any GI issues and my normal bowel movements returned. The following day, I ate about 2100 kcal, including some fried chicken wings. I also had three cans of beer. Not that I recommend that, but I was sitting together with some friends for the first time in a week. The beers had a funny effect; they definitely felt a lot stronger than usual. I probably won’t do that next time. What where the results of my fast? I like tracking numbers, but to me the two most important aspects are the stability of my metabolism and mental performance. As after my previous fast, I am experiencing a much more stable energy supply during the day. I can go longer without food without excessive cravings and feelings of running low on energy. This better supply of energy has a profound impact on my cognitive performance. I can work a lot longer and with a sharper mind. My mood is better as well. I find fasting quite boring actually. Water, black coffee with some fat, 7 g of salt, and 320 mg of magnesium don’t make for interesting meals. Eating and shopping for food are such an important part of my day. Nevertheless, I intend to go for another fast. The effects are worth it to me! My plan is to do one 5-day fast every three to four months. I left it too long since the previous fast (late July last year). My weight dropped by 6.3 kg, from 100 kg to 93.7 kg. Obviously a lot of this is water loss and will come back. As of March 27, my weight is 95 kg. My waist dropped from 110 cm to 101 cm. My fasting blood glucose dropped from a peak of 104 mg/dl to 55 mg/dl within 5 days. The average of 14 measurements for the last four days of the 6.5-day fast was 68.75 mg/dl. I got into moderate ketosis starting from noon on the second day, when my blood ketones reached 0.7 mmol /l. 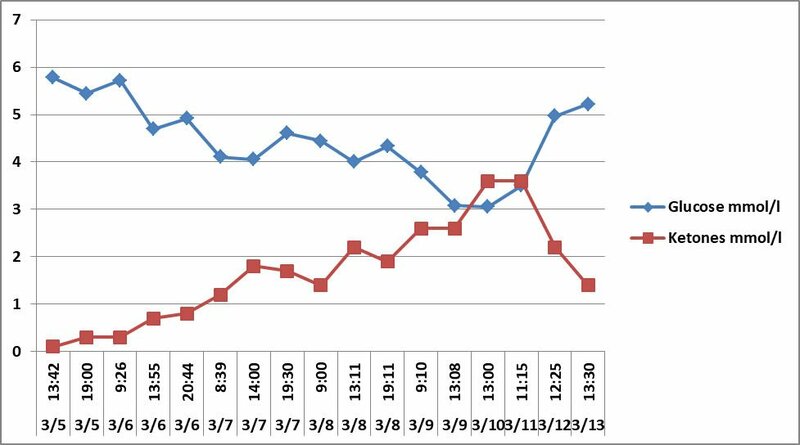 Ketones started to rise significantly between morning and lunch on the third day (1.2 to 1.8 mmol/l). My blood ketones reached a maximum of 3.6 mmol/l. I took my measurements and stopped my fast on March 11, 11:15 am. I continued to measure glucose and ketones for two more days after the fast. Then I ran out of ketone sticks, so that’s where the chart ends. I continued to measure morning blood glucose until March 16. It returned to pre-fast levels of 104 mg/dl. Then I ran out of glucose sticks as well. I will re-order and plan to do glucose measurements from time to time. Note: To make the numbers for glucose and ketones in the chart comparable, glucose is also expressed in mmol/l (as common in Europe). Multiply by18 to get from mmol/l to mg/dl. End of the fast was on March 11 after the 11:15 am measurement. How to improve my experience during my next fast? I plan to cut club soda to a max of two cans per day. Maybe even only one. During this fast, I had three cans on some days. Excessive sodium bi-carbonate seems to give me GI problems while fasting. I have to be even more consistent with salt and magnesium intake. I’ll add 2.5 grams of salt to a glass of water first thing in the morning. Right from the start, I will add lime or lemon juice to my water and experiment with apple cider vinegar. I might also increase my MCT oil intake during the second and especially the third day to alleviate low-energy symptoms. Finally, I plan to hit the gym and add a bit of moderate exercise during the next fast. During this fast, I walked for maybe a total of one hour every day. It tastes good and it has no additives. I do not yet have any particular preference for which MCT oil to use. I did three glucose measurements per day: morning, noon, early evening. I find it useful to have glucose strips in reserve to measure the impact of individual meals whenever I want. Ideally I also wanted to do three ketone measurements at the same time as glucose. Later, I was running low on ketone strips, so I switched to only noon measurement. Fitbit Charge 2 to track sleep and heart rate. Metabolic issues can appear well before a diagnosis of diabetes. One doesn’t even have to be overweight to run into trouble! The best part of his message: I can do something about it. I found his research and lectures eye-opening and learned a lot from them. For me, they may well have been life-changing, regardless of what diet I will follow in the future. They also have an info sheet for doctors. Dr. Fung is a Canadian kidney specialist who uses intermittent and extended fasting to treat metabolic disease, including diabetes. He has been using fasting protocols with patients for many years. I found this interview with Dr. Thomas Seyfried highly educational. Dr. Seyfried’s argues why and how cancer is primarily a metabolic disease. I found his elaborations on salt intake during ketogenic diets very helpful (Part 2). I significantly ramped up my salt intake during my most recent fast. Dr. Phinney is no friend of multi-day fasting. He is concerned about loss of lean body mass. Instead, he is a proponent of an ongoing ketogenic diet as a life style. A ketogenic diet is a very-low carbohydrate, moderate protein, high fat diet that puts the body in ketosis for almost all of the time. I had tried a ketogenic diet for 6 weeks a few years ago. Ultimately, I want to enjoy more carbohydrates than permitted on a ketogenic diet, and I had a few unpleasant side effects. I also found it difficult to arrange with my social desires and commitments. However, I find the ketogenic diet a very interesting tool. Under the right circumstances (or when desperate enough), I might do it again. This site has a max fat burn rate calculator and interesting references. This entry was posted in Performance and tagged Fasting, mental performance, metabolism, performance by Helmut. Bookmark the permalink.